Is that it’s finally over. I actually feel a glimmer of hope about the next four years, and am powerfully relieved that America re-elected Barack Obama. No lame duck president, no conflict between the outgoing and incoming administrations, no radical shifts (I hope) in foreign or domestic policy, and no constant bellyaching about how the previous party/president is responsible for this whole mess. 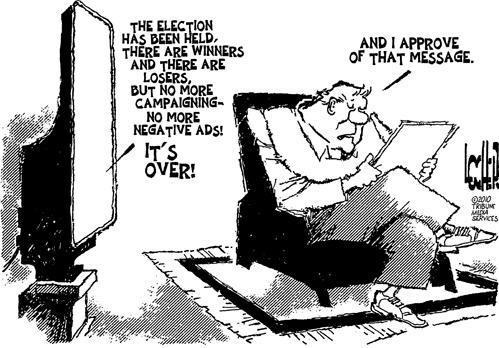 Added bonus: No more political ads! I approve of that message, too. This entry was posted in Current Events, Funny Pix, Politics and tagged election, obama, president by Lisa Shaw. Bookmark the permalink.